The Nucleus 3 adds 24" extensions, a 12 space rack, a sturdy keyboard tray and second tier to the base model in the Nucleus series, and can be expanded with all the other options available in the series. The Nucleus Series modular workstations from Ultimate Support represent a new solution for both professional and project studios. 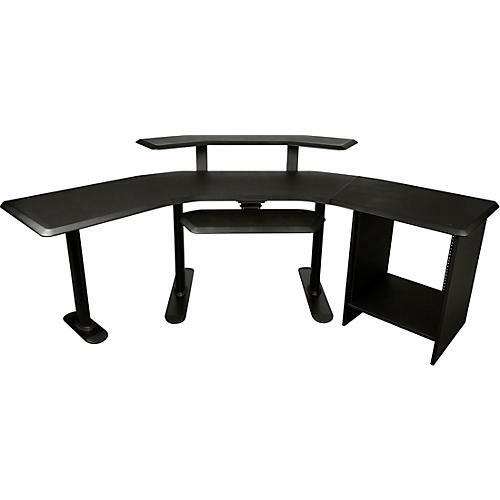 Starting with the highest quality base model in their price point, the Nucleus Series desks are made from high-quality materials and allow you to expand your workstation as your needs grow: all while providing a quality level and feature base miles ahead of other desks at their price point. Once you've built your studio around a Nucleus series workstation, the only thing you'll ever have to change is how many accessories you add to it. You don't have to settle for less to stay within your budget anymore. Lifetime warranty on guitar, keyboard, and speaker stands.